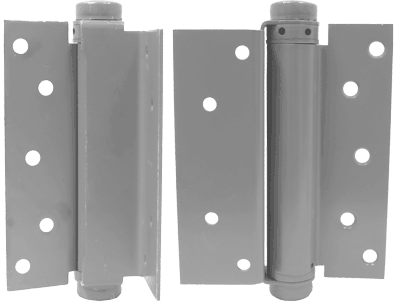 •Single acting half surface spring hinge is designed to fit door 1 3/4’ to 2” max thickness. •Door flange is designed to surface mount metal or wood doors. •Permits doors to open in single direction and automatically return to the closed position. •Pivot points do no align with standard full surface hinges. It is advisable to use three hinges on a door. The center hinge should be installed as close as possible to the top hinge for maximum support. Hinge capacity decreases as door height decreases. Request template from factory for door and frame clearance required. DO NOT USE ON DOORS WITH HINGE EDGE BEVELED. NOTE: Wind Conditions, excessive air pressure, use of gasket for smoke or sound protection may prevent door from latching. One hinge per plastic bag, 2 hinges and 1 screw pack per unit carton. 1 screw pack includes all machine screws (28), and 1/2 wood screws (14). ATMS & AWS also available.